You may well be aware of the alarming increase in the incidence of childhood obesity in the U.S. Our kids have gotten significantly fatter in the last 50 years. 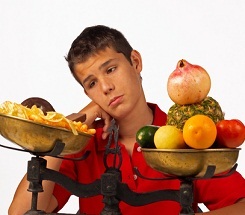 The Center for Disease Control reports a 54% increase in obese kids aged 6 to 11 and a 40% increase in teens. If you haven’t heard, well, now you know. I’ve a sneaking suspicion you probably didn’t hear it here first. The rise is so significant and disturbing that the alarms are being raised at the federal level and are forcing all of us to evaluate what goes into school lunches to how much time children are spending in sedentary pursuits. As the mother of four kids this is an uncomfortably familiar problem. If it’s a little too close to home for you, too then take comfort in the knowledge that we’re all in this together and together we can solve this problem for our kids’ future. One of my daughters has inherited the family sweet tooth and unfortunately, her weight puts her BMI (Body Mass Index) at the very upper limits of the healthy weight range. According to our pediatrician, she is at-risk for obesity issues later in life. I struggle with the need to balance her unhealthy eating habits with my desire for her to accept herself as she is and not struggle with the body image issues so many girls and young women battle with because of unrealistic (and extremely unhealthy) standards set by the beauty and fashion industry. After taking her measurements recently so I could sew her a dress, I was so disturbed by her waist measurement that it shocked me out of my reverie. It was definitely a wake-up call. It’s a parenting moment that forces you to face the truth and either gloss over a painful problem you feel helpless to solve, or resolutely determine to correct it before it grows into a major life issue for your child. At every stage of your child’s development you are in charge of the foods that are put in front of them. I don’t know about your kids, but my children just want to eat junk; boxed Macaroni and Cheese, candy, ice cream, sweetened cereals, pancakes and syrup and sweet drinks. Vegetables? Fuhgeddaboutit. I can sympathize with the difficulty of getting your kids to eat healthier foods when they turn up their little noses at anything you put in front of them that’s new. Your fears about them starving to death because they refuse to eat the healthier alternatives you’re offering them are unfounded, so relax. If your family is already used to having the bad stuff around all the time, it will definitely require some ‘weaning’ and time to adjust. Adjusting their palates gradually will make it much easier for your family to accept the healthy changes than to spring it on them suddenly and expect them to give up their favorite treats cold-turkey. Most of the eating your children do is at home so it’s important to stock your kitchen with healthy choices. Try making healthy substitutions in foods they’re already familiar with. Stock your pantry with healthier snacking alternatives for the afternoon doldrums and don’t let anyone mindlessly eat while watching T.V. Great snack ideas are nuts (almonds, dry roasted peanuts, pecans, Macadamias) dried and fresh fruits, granola bars, low-fat yogurt, whole-grain cereals, raw vegetables and low-fat cheeses. The biggest obstacle we all face when controlling our eating habits is appetite control. Researchers have identified the hormone responsible for your sense of hunger and it’s called ghrelin. They’ve also discovered that people who are already overweight and carrying excess fat have an overproduction of ghrelin – their bodies are essentially lying to them telling them that they’re hungry and they need to eat, even though they clearly do not. For me this was a huge insight! Realizing that gave me the strength to ignore the false hunger signals until I got my excess fat stores under control. Another important finding that was a lifesaver for me was the research that demonstrated the increase in the production of ghrelin when you’re sleep deprived. Sleep deprivation happens and sometimes you just can’t avoid it (especially when you’re up all hours with tiny babies, or sick kids), but just knowing that you’re going to battle the hunger monster the next day can keep you mindful about your food choices until you catch up on your sleep. It also underscores the importance of good sleep hygiene for you and your kids. Be a good role model and set a good example for your kids. If you’re packing on a few extra pounds, ask yourself if that’s the example you want to be setting for your children. Take charge of your own health first. Be the leader your kids will follow. Your own health and your waistline will benefit, too. I’m glad to say we’re tackling it together as a team and I’ve enlisted the whole family’s support. My daughter’s clothes are already fitting better and today she was wearing my sundress!